Here at Big Horn Trading, we are excited to put another unique item on our shelves. 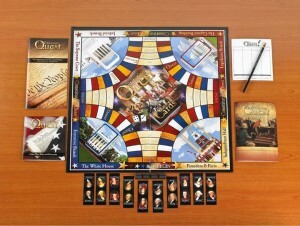 The “Constitution Quest Game” by Cognitive Square, Inc. is a fun and empowering way to learn the U.S. Constitution. In fact, students claim that the “Constitution Quest Game” has helped them to confidently pass their government exams. It’s one thing to learn the U.S. Constitution, but it’s another to actually remember it. This game was created to raise the Constitutional IQ of Americans and is widely used by teachers, home school parents, and even grandparents who strive to teach their kids what the U.S. Constitution is all about. Those who play this game will walk away with an expanded knowledge of the Article and Amendments, pertinent vocabulary, as well as the powers granted and denied by the Constitution. For more than three years, this effective game has been selling across the country and teaching people within the age range of 10 and 84! Teachers – the “Constitution Quest Game” even has one round specifically designed to fit into your schedules. This round can easily be played during a classroom period/teaching session; including game set-up, game play, clean-up, and review. Don’t miss your opportunity to learn about the history of our country and to become a more empowered citizen through this American-made game. Check out the video below to find out more about the “Constitution Quest Game”. Big Horn Trading is your friendly downtown pawn shop, and a member of the National Pawn Brokers’ Association – meaning your transactions will always be confidential. We are also Sheridan’s only Class III firearms dealer. authorizing us to sell silencers and other Class III firearms and accessories. Whether you’re looking for Class III firearms accessories or a pawn shop – or anything in between – come on down to Big Horn Trading to see John or Kathy Lundberg.